Relationships between people are vital. It is what distinguishes all of the advanced animals in the world. However, the more time you spend with a person, the more complicated the relationship gets. By spending a lot of time with someone you get to know all of their ins and outs, their little quirks as well as their major flaws. If you want to have a proper relationship with that person you need to accept them for who they are and not try to change them as in most cases it will not work anyway and it will push that person away from you. If he is an avid worker that spends most of his time in the office, learn to accept that. If he is a slacker that sits around in his underwear all day and watches Looney Tunes then you have to accept that as well. It is ok to give advice and encouragement on how they can better their lives, but avoid ultimatums as they rarely serve their purpose. All good relationships are based on trust. If you do not trust that person then there is little chance that whatever is going on between you will ever go past the point of a platonic relationship. Most people choose their friends on the basis of if they can trust them or not in certain situations. Sometimes it is hard to tell if someone is trustworthy or not. The best thing to do is just to take a shot in the dark and see what happens. It is only fair that you give people a fair chance to prove themselves to you. We’re not saying that you trust them with the family savings right off the bat, but a plant that needs watering while you are away for a few days will suffice as a trust exercise. If the plant is dead when you get back, the person is either not trustworthy or suffers from memory losses. Either way they owe you a new plant. Communication is very important for any relationship to flourish. Talking with each other effectively will develop and strengthen any bond between two people. This way you can really get to know the other person. Make an effort to gain knowledge about all the specifics about him. This does not mean learn where he was born, what is his blood type, how he likes his pancakes etc. You are not taking a quiz on them. Figure out what makes them unique. Why is that person so special that you want to establish a connection with him? After you know someone better it will be easier to decide if he deserves your trust or not. However, remember that to err is human. It is alright to give someone a second chance, as long as they did not do something like running over your cat while they were backing out of your driveway. If it is a situation where you feel that the person broke your trust, do not be afraid to bring this up with him. If he is genuinely sorry then he deserves a second chance. If not then he clearly was not deserving of your trust in the first place. Whenever you are thinking about whether you trust someone or not, think of certain situations that prove to yourself who is deserving of your trust and who is not. A lot of people can be trusted when the stakes are small, but who do you turn to when they are high? You probably have only two or three people that you would trust to hold onto a million dollars for you. However, you know dozens or hundreds of people that you would trust with one dollar. Also take a look at a person’s track record when deciding whether to trust him or not. 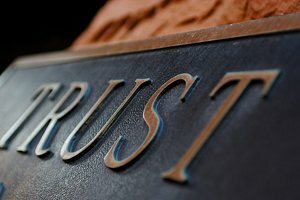 If he has no reputation of being unreliable and has not wronged you or any other important people in his life before, then there are good chances that he will be a trustworthy friend. Of course, do not take this to the bank, as anyone can surprise you given the right circumstances. After all, Brutus betrayed Caesar and they were BFF’s. Trust can be broken through many actions. They can promise to do something and then not do it, they can cause you harm emotionally, physically or financially through their actions etc. However, the most common way that someone betrays someone else’s trust is through lying. Sure, there are little white lies that people say to make the other person feel better (“You don’t look fat in that dress, honey.”) Those are not the case here. Although still lies, they are used to enhance the relationship. The bad lies are the ones that people use because they want to avoid an unpleasant situation or punishment for something that they did. If someone is doing that to you then they clearly do not deserve to be trusted. Fortunately, there are ways to tell if someone is lying by simply observing them when they talk to you. But first you must clear your mind and be as objective as possible. Do not embrace the truth to quickly simply because it is less painful. Try and remain calm and ask yourself why would the person lie to you and what could he gain from it. After all, most people do not lie for no reason. Just be prepared to find out the truth, even if you might not like it. If you already know the person pretty well it should be easy to see if they are lying. Hand and eye movements of people when they are not telling the truth are different than normal. They either remain more stationary than usual or they flail around like crazy in an attempt to cover it up. That is because most people are not genetically built for lying. Our body wants us to tell the truth so there are plenty of “tells” that can give someone away and most of them are due to the stress that lying causes someone. Once you have in mind the normal way in which that person has a conversation look for the traditional signs that most people exhibit when they are being dishonest: they avoid eye contact, usually right when they start lying; others stare at you more than normal in an attempt to compensate; they will make certain gestures like swallowing repeatedly, blinking rapidly or scratching themselves; they will touch their nose, mouth or ear with their hands; their voice will be a little higher in pitch and, last but not least, some people say that when you lie you look up and to the right which stimulates the imagination part of the brain, instead of looking up and to the left, which is used to recall memories. If you suspect someone of lying to you but you value your relationship with them too much just try and ask them outright to tell you the truth. If your initial instincts were correct when you decided to trust them in the first place, they will eventually abandon the charade and come clean with you, regardless of the consequences.